Have you ever wished that your lens could focus closer than it does? Imagine that you could put a magnifying glass in front of your camera's lens. Close-up lenses work in this fashion and are the simplest and least expensive method of close-up photography. 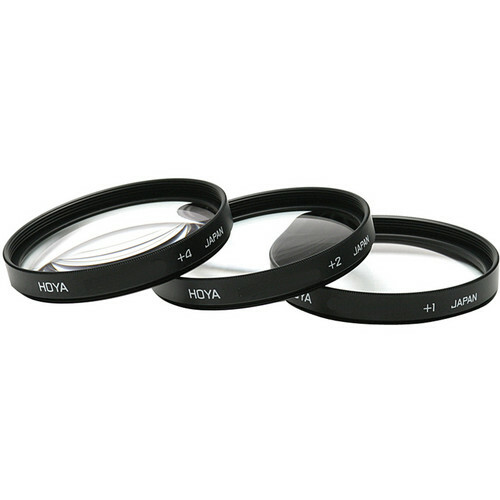 The 58mm Close-up Kit (+1,+2,+4) Lens by Hoya is available in different "powers" (diopters). A +1 close-up lens will allow you to focus your lens somewhat closer than it already does. A +2 close-up lens will allow you to focus closer than the +1. A +4 lens will allow you to focus even closer than a +2, and so on. These lenses can be used individually or in any combination to achieve ultra-close focus. The maximum magnification achieved with these attachments will depend on the focal length of your lens as well as the actual close focusing capability of that particular lens. Box Dimensions (LxWxH) 9.4 x 4.6 x 1.4"
58mm Close-up Kit (+1,+2,+4) Lens is rated 4.8 out of 5 by 8. Rated 5 out of 5 by Anonymous from Macro Made Easy As a serious amateur photographer, I find the close-up lenses a convenient solution to occasional macro photo needs. I use them for flowers and vegetables, insects and pets, and for architectural details. The lenses are easy to screw on, and deliver sharp and true-color images without loss of light. The lenses help crop out extraneous details and reduce depth of field so that only the most important subject is in focus. Good creative tool. Downside is that they magnify movement (by subject and me holding the camera) so a tripod is sometimes needed. The case, while very protective, is bulky and has too much Velcro. Screw-on end caps are more convenient; should be offered as an accessory. Good way to extend your photo capabilities. Rated 4 out of 5 by Anonymous from Really cool effects The things I use this for most are abstract closeups, and it's really not as magnified as I would like, but I use it with a more powerful one stacked on top, and it works out beautifully. A couple problems I've encountered are that it's harder to focus, and once I get a focal point, it sometimes causes the focus to shift right as the shutter snaps. Rated 5 out of 5 by mrhollio from Great set! I've been planning to do some close up work for a friend. The filters arrived last week. The kit included a tri-fold case with individual pockets for 4 filters. I immediately set to test them out. I started with the +1 then the +2 and then the +4. All three were crystal clear throughout the frame field and then again when they were stacked together in all combinations. Good tight fit on the lens (no wiggle) and all are easy on and off. To make it even better the kit is a great price! Rated 5 out of 5 by Pingpaul from Close-Up Kit Makes a HIt Floral and other specimens are the usual subjects. The lenses are easy to mount and remove from my primary Nikon lense. Rated 5 out of 5 by XOTTAVENTO from Great product and price Clear pictures and nice quality optics. I'am using this kit and in addition, a +10 filter on a 50mm 1.8 Nikor lense to shoot macro.I'am not a professional photographer but this combination is working great for me. Rated 5 out of 5 by Mohammad D. from Wow This is really cool, for the price, suddenly you get an image that looks new to your eyes. You may want to use a tripod as any movement might be increased by 2 times factor. Rated 4 out of 5 by eladbari from Great macro abilities I'm using this on my 5Dmk2. This thing is very useful to quickly get macro shots instead of switching lenses all the time. Image quality is good. Rated 5 out of 5 by Washburne from Works like a charm! Perfect solution for someone looking to get those close shots without buying a new lens.